Since June 2004 ANA is able to provide news feeds in NewsML 1. NewsML 1 is used to produce real time collections of news called “ipernews”. Standard text feeds and multimedia feeds (= “Lines” product) formatted as NewsML 1 available. Financial and Corporate Press Releases to Investor Terminals including Bloomberg and Reuters as well as internet infomediaries, research databases and websites. Multimediafeed (text, picture; audio & video) to websites/SMS/WAP/MMS of media clients and telecom operators. as well as daily breaking news content. A NewsML 1 compliant news feed. CTK has been providing its clients with a limited multimedia feed in NewsML 1 format since 2003. CTK’s new multimedia editorial system is completely based on an XML format derived from NewsML 1 . Regulatory News Service from global sources for publication to financial terminals and the internet. Kyodo News is the leading news agency in Japan – distributing NewsML 1 services to newspapers and websites with IPTC Subject NewsCodes in Japanese/English. This service is availalbe in the NewsML 1 format. We’re using NewsML 1 as the intermediary repository for news content. In house writers publish articles to a database using a homegrown CMS. Once an issue is ready for publication, it is stored in NewsML, where it is cached for output through PHP. The NAMC Newswire provides orignal news articles and press release distribution. We provide news and press release distribution in the NewsML 1 format as well as our orginal format. On inquiry of agencies and media Newspress.de (npre) makes available the topical textannouncements from economy sources in the NewsML 1 format. PA provides “Top 10” story collections in NewsML, with associated pictures, to a wide range of traditional media and corporate organisations, covering a variety of topics such as news, sport, and entertainment. pressetext, a multimedia news agency located in Austria, Germany and Switzerland provides NewsML 1 feeds with photos mainly in German as well as in English, French and other languages via internet and satellite. By using this standard companies and clients can easily integrate news from pressetext into their applications. NewsML 1 compliant text news feed of the daily newspaper. ThomasNet Industrial Newsroom provides current, reliable industrial news articles which are delivered on a timely basis covering the whole range of products from adhesives through waste handling equipment. Web online services can subscribe to several news feeds from the online version of the Wall Street Journal, packages are delivered in NewsML 1. Editorial Systems from CCI Europe use IPTC NewsML 1 with IPTC NITF for 2-way integration of 3rd party systems for archiving, web content management, e-paper, wires, events, syndication etc. Dawnnews has developed a news room system NEURON which integrates receiving and sending feeds in the NewsML 1 format. We provide software for the production and distribution of (audio)-news. Client applications for editors linked to a suit of server applications for the automatic production and distribution to end users using push and pull. NewsML 1 is used for the communication with the editorial intranet and the distribution to endusers. Digital Collections Asset Managment solution uses IPTC NewsML 1 for integration of wires, editorial, web CMS, e-paper, syndication etc. Eurocortex provides pure web solutions to manage (edit, search, export, ..) newswire information and miscellaneous multimedia content for the Press and Media industry. MCTEL Content Delivery Platform supports NewsML 1 down streams to automatically make available news for mobile users. Updated news will be displayed in Wap portals and text or multimedia news could be pushed to opt-in subscribers using SMS or MMS. Premium SMS and MMS may also be used and will charge subscribers in real-time for content. News may also be browsed using USSD menu application. The MCTEL solution will also embed the SMS Gateway, MMS Gateway, SDP, USSD Gateway and IN Prepaid platform interworking to allow any mobile operator to provide complete content services to its subscribers. Our Web CMS (Koorou) supports down streams and up streams NewsML 1 content. All NewsML content can be updated via our Flash(tm) User Interface. If you are interested, contact-us. Koorou is multi lingual. NewsBoss is a complete solution for radio station newsroom operations. NewsBoss can automatically ingest text and audio data from a variety of sources including news wire services. Comprehensive tools are included for editing and management of both text and audio content and preparation of newscasts. Integrated on air presentation tools enable professional broadcast of complete newscasts. NewsBoss supports ingest of NewsML 1 format news wires and has support for the automatic export of newscasts in NewsML 1 format for use on web sites and other devices which support reception and display of news content. Profium Ltd provides solutions for managing rich digital content by leveraging latest technologies of semantic web. Profium Semantic Information Router (SIR) software serves multimedia archiving, centralized metadata management and real-time routing of content for cross-media publishing. Profium’s scalable solutions are used across Europe in a variety of industries ranging from media and telecom operators to public sector. The company is based in Finland with a sales representation in California, USA. Profium’s future-proof system is easy to deploy and integrate with existing applications and environments, ensuring fast return on investment. The system runs on J2EE application server and relies on open standards. Profium SIR integrates with Microsoft Office, Adobe InCopy and InDesign, and supports industry standards like NewsML 1 / XML, and NITF. 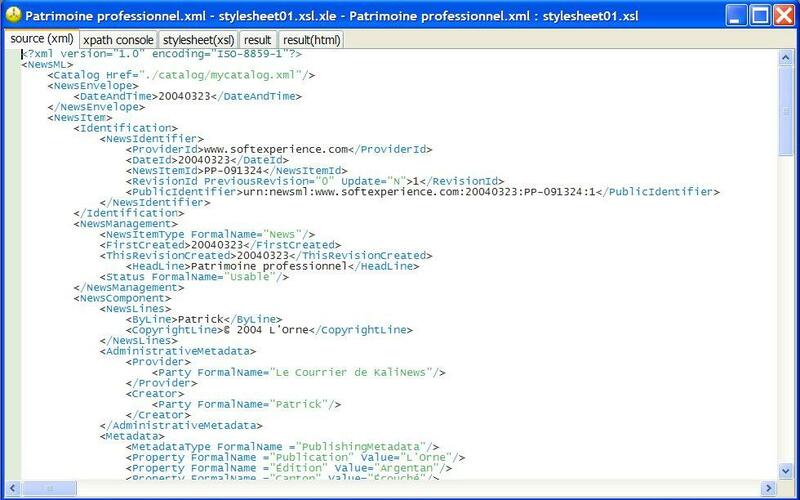 XML data feeds like NewsML. XSLmaker allows users to drop NewsML 1 data nodes directly on Canvas and apply CSS styling to them to create any kind of Web pages. The tool supports inclusion of live XML feeds that ensure your style-sheets will read the most current data every time they are invoked. You can start creating your own page s based on NewsML today by downloading our FREE trial version now. SSL’s Gravity Asset Management Products incorporate NewsML and NewsML-G2 data sets compatibility to allow for the automatic population of textual metadata to the Gravity database. This feature allows our customers to immediately begin work on production elements while large media files are still being ingested into the system. Gravity also allows users to export Gravity Metadata in NewsML and NewsML-G2 formats thus enabling users to extend the use of Gravity based media to other their party systems. Our Asset editorial content workflow software integrates both upstream and downstream NewsML 1 feeds allowing them to integrate fully into the copy, picture, page, web and archive workflow of the product. “nm_fusion” suite for software applications for news content. NewsML 1 feed up and down stream can be handled. Ready solution for advanced notification and alerting applications via email, wireless, web, or RSS. Easy setup with direct integration of NewsML 1 feeds. Offer new delivery channels for your content and create additional subscriber value and revenue opportunities. The Xtenit platform combines content management, personalization, and delivery to enable a complete solution for producing, publishing and managing customized electronic communications.